Prime Minister Narendra Modi has more or less set the tone for the current election campaign for the Bharatiya Janata Party, in his recent election rallies. He has cleverly identified issues that the chief opposition party, the Congress, is on a weak wicket. And he has ensured that the agenda he has set cannot be ignored, not just by his rivals but also by the electorate. The prime among these issues is nationalism. Prime Minister Modi was quick to latch on it in his poll rallies, demanding a response from the Congress, which is an ally of the National Conference. 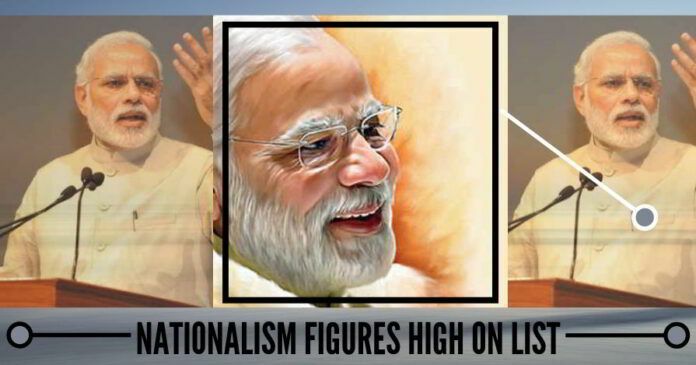 Nationalism has many hues which have found resonance with the people, partly due to its intrinsic quality and partly because the BJP has used it effectively so far. A series of events has helped bolster the party’s credentials to protect and promote nationalism. The surgical strikes two years ago by the Indian Army into Pakistan-occupied Kashmir and the more recent air strikes deep into Pakistani territory which destroyed a major terror training camp, would arguably not have become a major election issue if the Congress’s response had been mature. But by questioning the strikes, demanding evidence despite the Indian defence forces’ categorical statement confirming the attacks, and even ridiculing the valour of the Indian Armed Forces by wondering whether they had uprooted some trees in Pakistan instead of terror, the Congress and other opposition parties ended up strengthening the Modi-led government’s credentials as a ‘doer’. It’s now too late for the Congress to make amends by nuancing its response. It is bent double under the weight of statements its senior leaders have made on the matter, ranging from the strikes to the image of our defence forces. One senior party leader had called the Indian Army chief a street goon, another had claimed that the Armed Forces had been killing more civilians than terrorists in Jammu & Kashmir, and a third had said that the Pulwama terror attack in which more than 40 soldiers of the CRPF had lost their lives, had been orchestrated jointly by Modi and his Pakistani counterpart for political gains. Yet another aspect of nationalism has been handed on a platter to the BJP, with senior National Conference leader Omar Abdullah saying that he favoured a return to the system where Jammu & Kashmir had a Prime Minister. The dual prime ministership concept was buried long ago, and by reviving it, he has only fuelled more apprehension on the path his party wants to take the State. Prime Minister Modi was quick to latch on it in his poll rallies, demanding a response from the Congress, which is an ally of the National Conference. Just by way of coincidence, many of its senior leaders who had been in the forefront of the Ram temple movement in the nineties, have either been denied tickets or have opted out of the electoral fray. The other issue is that of the so-called Hindu terror. The recent acquittal by a court of the accused, including Assemanand, in the Samjhauta blast case, has given fodder to the BJP to lash out at the Congress for implicating Hindu leaders in a terror-related matter. Here too the Congress’s track record has been rather poor. When the party-led UPA was in power, and even thereafter, many of its leaders had spoken of Saffron terror or Hindu terror. The general impression has been that the Congress and its friends used it to divert attention from mainstream terrorism in order to appease a certain religion section. Prime Minister Modi raised the issue in his recent election rally in Wardha in Maharashtra. Connected with this is the potshots that the BJP has been taking over senior Congress leaders, particularly party chief Rahul Gandhi, playing the soft Hindutva card by paying visits to various Hindu religious shrines —- Rahul Gandhi even made a trip to Kailash Mansarovar. One leader claimed Rahul Gandhi was a sacred thread wearing Hindu and true Shiv Bhakt. The BJP is gleefully reminding the people that the Congress-led UPA had filed an affidavit in the court in connection with the Ram Sethu issue, which said that Lord Ram was a myth, and that he did not exist. Although that affidavit was later withdrawn, the damage had been done. While on the subject of Hindu pride, the issue of the construction of a Ram temple in Ayodhya should have neatly fitted into the overall narrative. However, it does appear that that may not become a central theme, at least across the nation. The BJP could raise it specifically in Uttar Pradesh, but even then it would not be high on the agenda as nationalism. There are two reasons for this. The first is that the party does not want to divert attention from other matters in States such as Odisha and West Bengal where it is seeking to displace the might of regional satraps and where the Ram temple issue does not have much traction. The second is that the party will find it hard, in case it decides to rake up the controversy too often, to explain why it failed to make any headway in the matter in the five years it has been power, despite the issue figuring in its manifesto. And, just by way of coincidence, many of its senior leaders who had been in the forefront of the Ram temple movement in the nineties, have either been denied tickets or have opted out of the electoral fray. This includes LK Advani, Uma Bharti, Murli Manohar Joshi, Kalyan Singh and Vinay Katiyar.